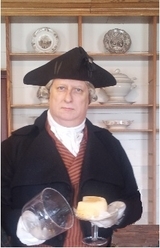 George Washington returns to the stomping ground of his youth, visits Stonyman Gourmet Farmer on his birthday & discovers his inner caseophile with aromatic farmstead cheese! Susan James conducts hands-on demonstration with Beverly Bates-Coakley at Dames d'Escoffier 2016 Symposium: How to make yogurt and transform it into peerless cheesecake! Stonyman Gourmet Farmer provides premium, small-batch, handmade cheeses made on the farm where the livestock graze. The appellation for this category of fine cheese is “farmstead.” As rare in Europe as in the US, premium farmstead cheese making seems to be gaining recognition: in addition to cheese superiority, sustainability has become a major focus. Stonyman’s local terroir includes the Southern Appalachians and Piedmont, its farming community. Dining — casual or formal, at home or in a restaurant — increasingly includes a cheese course of some kind. Stonyman Gourmet Farmer has worked hard to develop a range of cheeses for all palates and occasions. We offer cow's milk, goat's milk, and sheep's milk cheeses. From strong, aged blues, to hard and semi-soft mountain tommes, to mild and creamy cheeses or fromage blanc, Stonyman’s offering is designed to match a variety of menus, paired with a full range of wines, ales, juices, condiments, and seasonal fruits and vegetables. Stonyman’s practice is to encourage visitors to taste as many cheeses as it takes to arrive at the ideal cheese board. Customers and staff enjoy comparing notes about the cheeses, proving that cheese culture is a natural backdrop to conversation and socializing.